Background: HSP90 is necessary for the conformational maturation of proteins, proteins disaggregation, folding newly synthesized peptides and the refolding of denatured proteins. The inhibition of HSP90 leads to proteasomal degradations of client proteins that finally kill cancer cells. 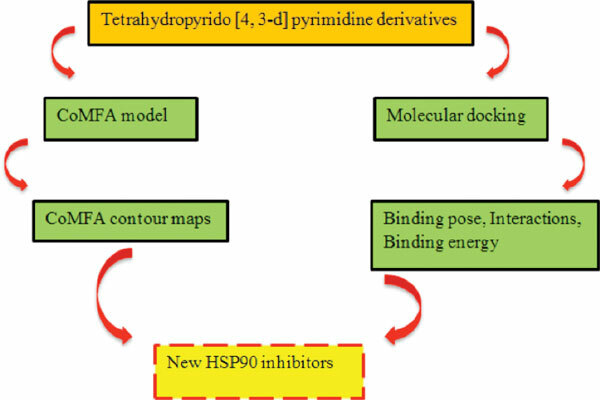 Methods: In this research, molecular docking and comparative molecular field analysis (CoMFA) were used to investigate the interactions of tetrahydropyrido[4,3-d]pyrimidine derivatives with the N-terminal domain binding site of the HSP90 and predicting their inhibitory activities. Results: A CoMFA model with five components and q2 of 0.81 was developed. R2 for training and test sets were 0.96 and 0.79, respectively. Based on extracted Contour maps for this CoMFA model, three new inhibitors with greater pIC50 with respect to the greatest active molecule in the data-set were designed by modifying molecule m45. Molecule m45 and designed inhibitors were docked to the N-terminal domain binding site of the HSP90. Designed inhibitors obtained lower binding energy with respect to m45. Conclusion: Based on extracted CoMFA contour maps, bulky substituents are favored for the R1 group and in R3 group, short and bulky substituents increase the activity of molecules. Less bulky and longer substituents are favored for R2. The molecular docking analysis of compound m45 with the N-terminal domain binding site of the HSP90 show hydroxyl group on phenyl ring is necessary to form hydrogen bonding with hydrophilic residues in binding site and a conserved water molecule. Molecule m45 has Pi-Sigma interaction with phenyl ring in the side chain of Phenylalanine 138 via isopropyl substituent on meta position of the phenyl ring. Also, Molecule m45 forms carbon-hydrogen bond with oxygen atoms at the side chain of Aspartic acid 54 and Asparagine 51 via its dimethylamine group. Others are Van der Waals interactions. Tetrahydropyrido [4, 3-d] pyrimidine, HSP90 inhibitor, CoMFA, molecular docking, polypeptide chains, cytoplasm.